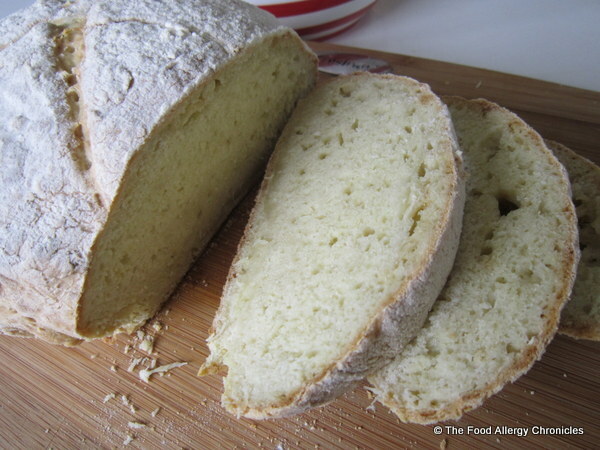 Posted on January 25, 2013 by Susan H.
A quick and easy bread…crispy on the outside…soft and tender on the inside. 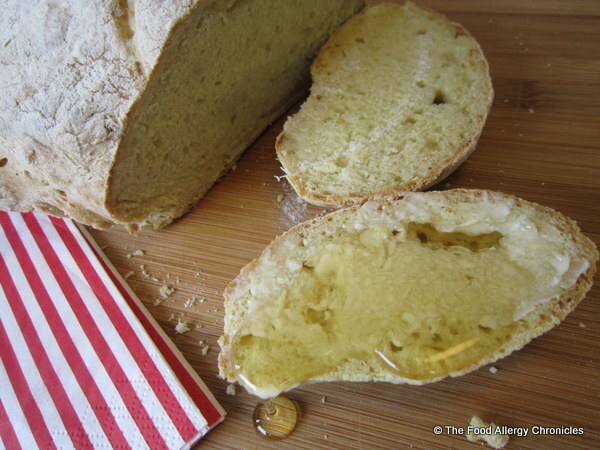 I found a nice simple recipe for Traditional Irish Soda Bread at Canadian Living…click here for the original recipe. Now I have to say, Michael was a bit sceptical of the bread…”Is it going to taste like bread?”, he inquired. Well, let’s be honest…Irish Soda Bread is not known for being ‘light’. 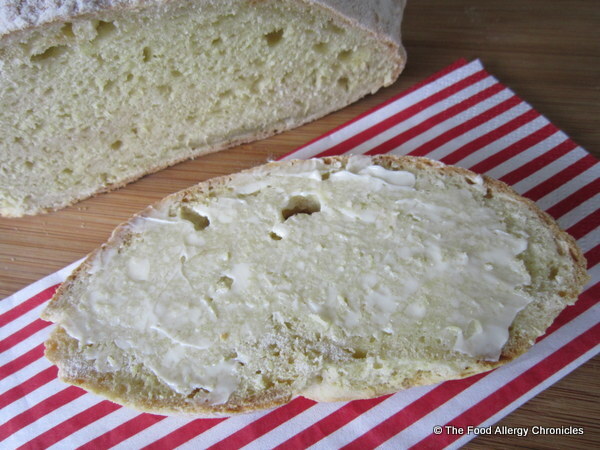 It is a dense, chewy, hearty bread…suited well, paired with a hearty stew. But just as nice with a drizzle of honey. First bite in…”Mmmm, this is good!”, Micheal announced with a note of relief in his voice. He ate the first piece so fast this is all that was left of it by the time I got the camera. Matthew tasted a slice of Dairy, Egg, Soy, Sesame and Peanut/Tree Nut Free Irish Soda Bread when he arrived back from his first exam. 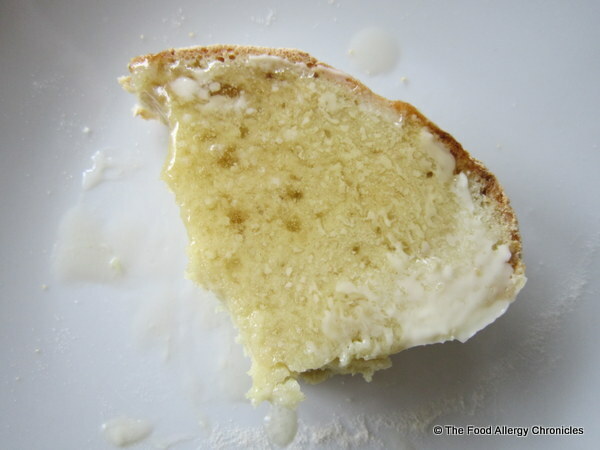 “It’s really good with the ‘butter’ (Vegan Becel Margarine)”, Matthew mumbled, while chewing on a mouthful. Tip: This dough is very sticky…I mean very sticky. Make sure you really flour your surface and the top of the dough before kneading it approximately 10 times. Keep adding flour to create a smooth, round dough. P.S. Luck was with me when I took a gander at the flyers yesterday…I noticed it was the last day for 50% off a Black & Decker All-in-One Automatic Breadmaker at Canadian Tire . Phew…just in time for Friday Night Pizza Night! This entry was posted in allergies, baking, breads, breakfast, dairy free, egg free, lunch, multiple food allergies, peanut/tree nut free, sesame free, soy free and tagged Black & Decker All-In-One Automatic Breadmaker, Dairy Egg Soy Sesame and Peanut/Tree Nut Free Irish Soda Bread, Natur-a Rice Beverage, Natur-a Soy Beverage, Vegan Becel Margarine by Susan H.. Bookmark the permalink. If you need more bread ideas to try adapting feel free to come over (when we are all better) and take a visual walk through my Bread Bible book. 🙂 But this sounds yummy, I love a good, dense, chewy, bread! I may have to try this one! Love this for “pizza!” Also, looks like it’s be great to mop up the extras of “spaghetti” (Spaghetti squash with marinara sauce) Italian-style. I hope you enjoy your new bread machine! I’m always impressed with all your yummy baking. I try to make Irish soda bread for St. Patrick’s Day each year. I’m afraid of yeast breads!! Do you have any resources for understanding how to use yeast?